In 2014, ETH Zurich unveiled LEE, a stunning addition to the historic university district commonly known as the “crown of the city.” Ten years in the making, LEE is the culmination of plans by the young architect Fawad Kazi, who was chosen in a public competition. A monument to architecture and urban planning, LEE’s ten stories and three mezzanines offer innovative new office and teaching spaces while simultaneously enhancing the urban surroundings. 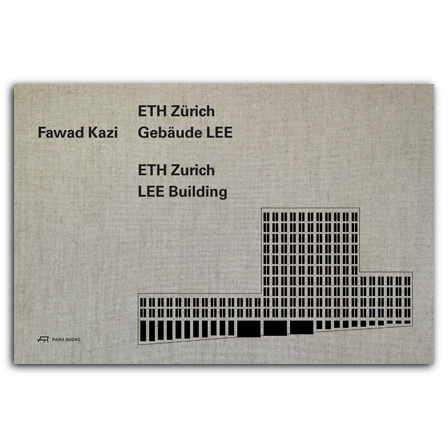 Fawad Kazi: ETH Zurich Building LEE fully documents the realization of this extraordinary project with contributions from the client, ETH Zurich; the engineers; and the architect himself. Richly illustrated with images by photographers Georg Aerni and Rolf Steinegger as well as many plans, the book includes a comprehensive documentation of the entire building, including many technical details and three hundred plans and images—most in full color. Among the topics discussed are the construction challenges posed by the massive precast concrete structure, the role of sustainability in the new building, and LEE’s tremendously successful integration into its urban context. , born 1963, is a buildings systems engineer and a partner and director with Amstein + Walthert AG Engineering and Consulting since 1999.
, born 1967, is a landscape architect and a partner with Hager PArtner AG Landscape Architects in Zürich and Berlin. , born 1950, is a Professor for Innovation and Technology Management at ETH Zürich. He graduated in mathematics from ETH Zürich and Imperial College London. He held various position in industry and has taught as a Professor for Innovation and Logistics at University of St. Gallen HSG. , born 1969, is a structural engineer and a partner with Walt + Galmarini Engineers in Zürich. He graduated in engineering from ETH Zürich and did his Executive MBA degree in Rochester (USA) and Bern. , born 1952, is a structural engineer and partner with Walt + Galmarini Engineers in Zürich. He graduated in engineering from ETH Zürich and has done his MBA degree at Nother Illinois University in DeKalb. , born 1971, is a structural engineer and a member of the executive committee at Walt + Galmarini Engineers in Zürich. , born 1971, is an architect and member of executive managment at Staufer & Hasler Architects in Zürich and Frauenfeld. He also teaches at Zurich University of Applied Sciences' Urban Landscape Institute in Winterthur. , born 1946, founded Kollhoff Architects in Berlin in 1978, with subsidiaries in Rotkreuz, Rotterdam, and Florence. He studied at University of Karlsruhe and Technische Universität Vienna. He taught as a Professor of Architecture and Technology at ETH Zürich 1990–2012 and as a Visiting Professor at Cornell and Syracuse Universities in the US and at Universität der Künste in Berlin. , born 1975, is abuilding systems engineer and a partner with Amstein + Walthert AG Engineering and Consulting in Zürich. He has been a lecturer in the Masters degree program in architecture at Fachhochschule Nordwestschweiz FHNW in Basel. , born 1961, graduated in architecture from ETH Zürich. He works as a project manager at ETH Zürich's real estate development department. , born 1964, is a scholar of art history and lives and works in Berlin as a feelance puclicist in architecture and the preservation of historic monuments.